Color can add a lot to a bride’s wedding dress. From accents to a fully colored gown, there are different ways that brides can add various amounts of color to their dresses. All brides want to incorporate color into their wedding ceremonies and receptions. These days, brides can also wear color on their wedding days. Wedding dresses have come a long way since the days where every single bride wore only white. If you want to consider colorful wedding dresses, ensure that you match the wedding dress colors with the colors of your eyes, hair, and skin. You should also coordinate the gown with aspects of your wedding theme such as floral arrangements, jewelry, and decorations. If you want to look at wedding dresses with color, but don’t want a fully colored gown, consider a waistline with a bold color such as orange. These waistlines can work as a bold but delicate gown detail. Many modern day brides add colored accents to their wedding dresses for a look that will pop in their wedding day photos. Black or colored embroidery can work as a beautiful and modern touch on a classic look on a designer wedding dress in Columbus. 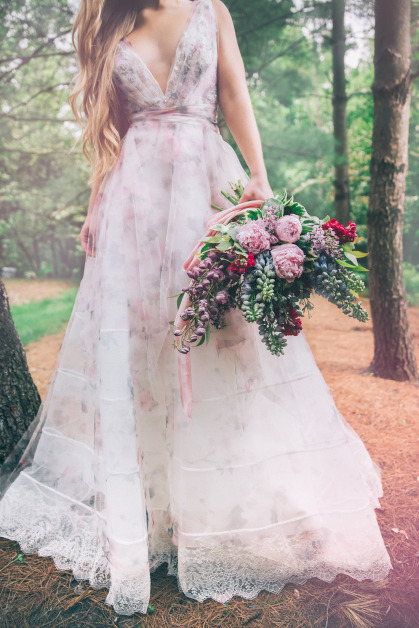 You can use the dress’ beading, sash, embroidery, bodices and corsets, inset skirt panels, or trim on the gown’s neckline, train, or hem to incorporate color into your designer wedding dress. Did you know that your dress could work as your “something blue”? A blue wedding dress can work in a variety of shades, from bright and bold for the daring and bold bride to those who want their dress to speak more softly. If you want to look only at unique wedding dresses with color, you’ll not only make a stunning entrance on your wedding day. You’ll also make a bold statement. If you’re wearing a fully colored dress, keep the bold statement going by matching your dress with your wedding jewelry and your veil and headpiece.